Hello! 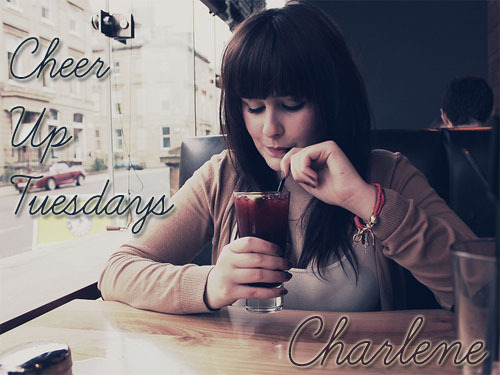 I’m Charlene, a twenty-two year old graphic design graduate from a small town just outside Glasgow. I work part-time in a call centre to pay the bills and spend the rest of my time doing things I enjoy such as some freelance graphic design work and painting nails for my nail art shop. My blog, Dainty Dresses, is a mixture of fashion, nail art, with the occasional beauty product review and lots of photos of my day to day life. Anyone who knows me will know I’m a massive fan of The Strokes so any song by them is guaranteed to cheer me up and even have me dancing around like a loon on occasion! The song ‘This Modern Love’ by Bloc Party has a special place in my heart and lots of lovely memories attached to it too, and you honestly cannot beat Florence & the Machine’s version of ‘You’ve Got the Love’. It’s the perfect song to belt out at the top of your lungs to make yourself feel amazing! This is such a difficult question because I have SO MANY happy memories but the first one to pop into my head was the memory of a glue stick fight I had with my friend Paul in college. I have no idea how it started but I can still picture us chasing each around around an empty classroom, each armed with a Prit Stick, trying to cover the other person in as much glue as possible. Typing it out makes it seem like such a childish thing to do, but it was spontaneous and so much fun. I didn’t enjoy Paul getting glue all over my beloved fringe though haha! I’d start the morning off with a plate stacked high with pancakes, lots of fresh strawberries and a cup of tea. Naturally my day would be spent with a big group of my closest friends and the sun would be shining, allowing us to laze around on blankets in a big park all day eating BBQ food, listening to music and having a cheeky drink or two. There would be some late afternoon shopping, followed by dinner at my favourite restaurant (Bath St Pony in Glasgow) and a visit to the cinema. It’s the simple things that make me happy! Over the past year it’s been a real struggle to maintain a positive outlook on my life, mainly due to being unsuccessful in literally hundreds of job applications, but I don’t think I’ve let things get to me too much. I find that finding things you enjoy that will keep you busy works best, such as diving into new hobbies and projects or learning new skills. Whenever something upsets me I allow myself a small amount of time to mope around, sob my heart out and get it out of my system before picking myself up, having a night of pampering and my favourite films and then it’s back to thinking positive thoughts to cancel out the negatives.